The Northern Wheatear, a member of the thrush family and commonly referred to as simply the Wheatear, is a summer visitor to Wales. These are largely terrestrial birds and they are to be seen on moorland and hillsides running and then suddenly stopping, cocking their head as though listening for something, and then running on. In rural areas they do occasionally appear in gardens, where they are welcomed by gardeners because they eat grubs, snails and other small pests. 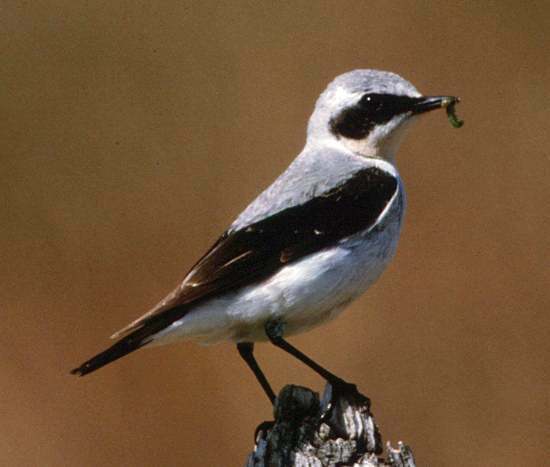 Wheatears nest in disused rabbit holes, in holes in stone walls, or in the shelter of an overhanging boulder. They lay typically four to six eggs of a pale turquoise-blue colour in April and May. They usually leave in October. 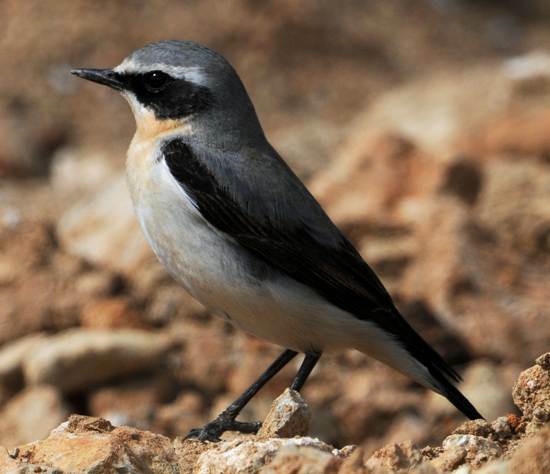 Compared with her mate, the female wheatear is rather more grey-brown above and buff below; the young of both sexes are similarly coloured. This page includes pictures kindly contributed by Melvin Grey and Ray Tipper.